This recipe is quickly becoming a fall favourite, it’s really simple and super delicious. The first time I made this recipe, Topher after the first bite said, “Damn, this is gooooddd”. I don’t generally post recipes that don’t get his approval, but he generally doesn’t have that kind of reaction. This would be an amazing substitute at Thanksgiving Dinner if you aren’t feeling the turkey! 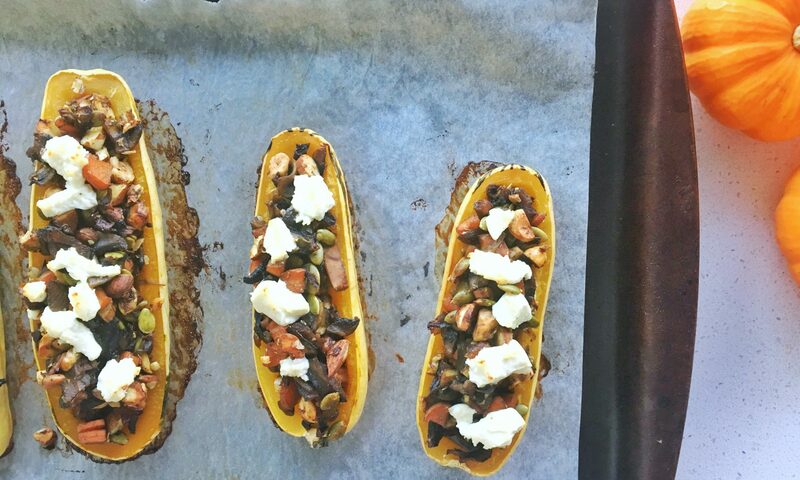 The inspiration for this recipe came from two places, the first being that I’ve been seeing all these delicious, beautiful stuffed squash recipes on Instagram, but they are all stuffed with quinoa or rice or beans. Personally, my body has a near impossible time digesting quinoa and beans and we tend to avoid rice, because Topher and I definitely feel our absolute best on a super low grain diet. You can absolutely use any squash you’d like to stuff in this recipe. I find either acorn or delicata squash works best, they also have the best flavour, in my opinion. Preheat your oven to 350ºF. Line a baking sheet with parchment paper. Cut your squash in half. Using a spoon take out all the seeds. Place your squash cut-side down on the baking sheet. Bake for 30-40 minutes or until fork tender. While your squash is baking, prepare the stuffing. Into a small pot put your dried mushrooms, cover with water and let simmer over low heat until rehydrated. Meanwhile, in a large pan, I like my cast iron for this recipe, melt coconut oil. Add your fresh mushrooms, onion, garlic, and carrots. Let your veggies sauté until translucent and soft. Add your poultry seasoning and salt and pepper. Once your dried mushrooms are rehydrated, chop them roughly and add them and the water your mushrooms were rehydrating in, into the onion mixture. Simmer until all the liquid has evaporated. Move your mushroom and onion mixture off to one side of the pan. In the empty half of the pan toast your nuts and seeds until golden. Stir everything together. Taste the mixture and adjust the seasoning accordingly. Once your squash is fork tender, remove from oven and spoon stuffing mixture into the squash, top with crumbled goat cheese and bake your squash again for about 5 minutes to warm your goat cheese through. Sprinkle the dried cranberries on top of the squash and serve with a big salad!